I can't tell you how many times my Adobe FrameMaker students ask where the "red squiggles" are when we start the lessons on text editing. In my humble opinion, there's not a whole lot to like about Microsoft Word, but I have to admit that I do use Word for writing, primarily to take advantage of Word's automatic spelling and grammar checks. I encourage my students to continue writing and editing in Word for the same reasons, before importing their docs into FrameMaker. Even though FrameMaker was initially conceived as a 3-in-1 program (word processor, illustration and page layout), let's face it, most people use FrameMaker because it excels in technical document layout, but FrameMaker does not excel in word processing or illustrating. The good news is that the new Adobe FrameMaker 10 offers Auto Spell Check, and with it, those beloved red (and green) squiggles. To activate (or deactivate) Auto Spell Check, choose File > Preferences > General. 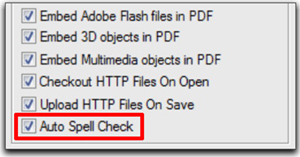 Ensure there's a check mark in front of Auto Spell Check and click OK.
Once Auto Spell Check is activated, FrameMaker will scan the document and highlight spelling mistakes. 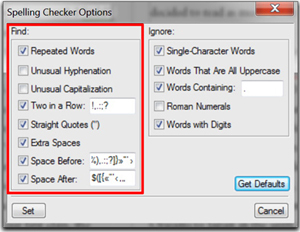 In Word, you have likely learned to recognize red squiggles as spelling errors. 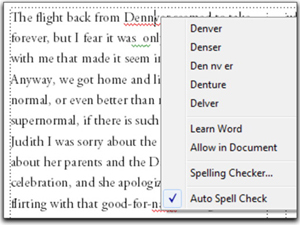 As in Word, you can now correct the spelling in FrameMaker by simply right-clicking and selecting the correct spelling from the list. 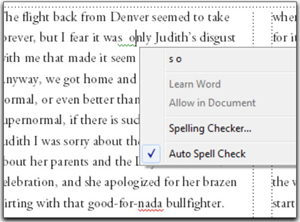 In Word, you are probably used to seeing green squiggles to indicate a possible grammar error. You will now see green squiggles in FrameMaker, but it's not quite the same thing. Auto Spell Check is just that: spell check. While FrameMaker will not evaluate your grammar, it will flag other types of mistakes. In this example, FrameMaker found two spaces between the words "was" and "only." Click the Options button to see what else FrameMaker is looking for (or ignoring). For instance, it's the Extra Spaces checkbox that asked FrameMaker to flag the double spaces above. I have a couple of authors who send me docs with straight quotes. I am going to enjoy this new feature in FrameMaker 10 to visually flag them. How will this change your workflow? If you are new to FrameMaker and want to get up to speed quickly, join IconLogic's instructor-led, online Adobe FrameMaker 9 or 10, Introduction class. Hope to "see" you there. About the author: Barbara Binder is the president and founder of Rocky Mountain Training. Barbara has been a trainer for nearly two decades and has been recognized by Adobe as one of the top trainers world-wide.